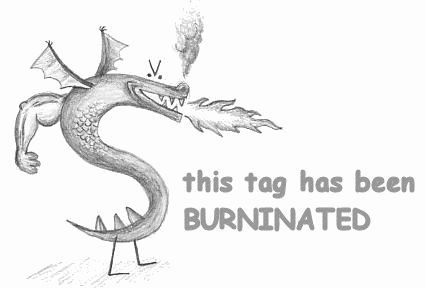 There are requests to "burninate" tags all over the place! What does this really mean; what happens to a burninated tag? How is it different than removing a tag or black-listing a tag? Would it be useful to include this definition in the Stack Overflow Glossary? It's right there in the Meme question. It means just deleting a tag. With fire. See Also: The official burninated dragon, Trogdor the Video Game. A tag, when it's burninated, is removed from all questions that carry this tag. The entire history of the tag is wiped out, with no trace of the tag existing in revision histories. This will just remove the tag from the system, but it can easily be re-created by users with the privilege to. If a tag is really bad, and chances are it'll be recreated soon, then it can be blacklisted. Only few tags are blacklisted, but there are many good examples, such as homework on Stack Overflow, or the pc tag on Super User, which are both Meta tags and shouldn't exist. To get a tag blacklisted, asking on the site's Meta is a good choice. This is nothing moderators can do—in fact moderators can't delete tags either—so it'll require community consensus and a developer to do that. Not the answer you're looking for? Browse other questions tagged support tags per-site-meta tags-burnination . What is a blacklisted tag? Why can't I nominate a tag for deletion when I review a wiki edit for it? Why do we burninate instead of blacklisting?